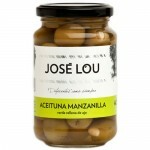 ‘Manzanilla’ olives from Andalusia (Spain), light green in colour with soft skin, fermen..
Queen (‘Gordal’ in Spanish) olives from Andalusia (Spain), green in colour. By mea..
Olives from Aragon and Catalonia (Spain). 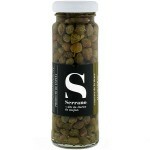 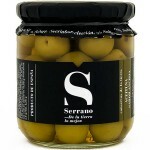 Naturally prepared, the olives gradually lose their ..
Black in colour is the olive par excellence from Aragon (Spain). 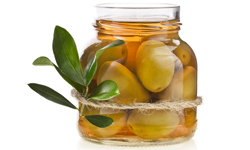 Acquires the perfect ripeness.. 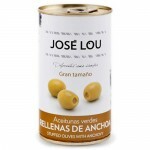 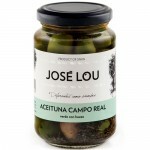 Whole Green Olives of the ‘Campo Real’ variety, seasoned with aromatic herbs, by Jose Lo.. 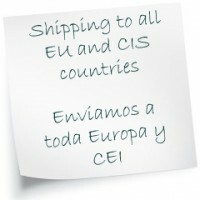 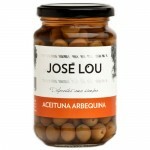 Pack ‘Whole Arbequina Olives’ & ‘Whole Black Empeltre Olives’ Net Wei.. 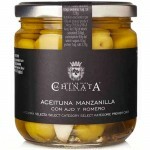 Pack ‘Manzanilla Olives Stuffed with Garlic’ & ‘Whole Queen Olives’ N.. 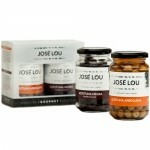 Whole Garlic Cloves with Virgin Olive Oil, seasoned with aromatic herbs, by Jose Lou. 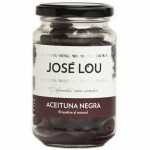 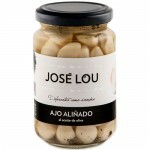 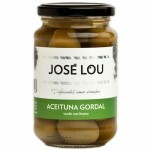 These whole..
Anchovy-Stuffed Green Olives by José Lou The perfect snack! 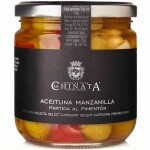 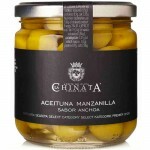 This is the perfect combina..
Manzanilla Olives with Garlic & Red Pepper by La Chinata Paprika is the secret to the excepti..
Manzanilla Olives with Garlic & Rosemary by La Chinata Manzanilla Olives with Garlic and Rose..
Anchovy-Flavoured Manzanilla Olives by La Chinata Anchovy-Flavoured Manzanilla Olives... what mak.. 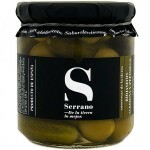 Whole Anchovy-Flavoured Olives by Serrano Serrano is a Spanish family business founded in La Rioj.. 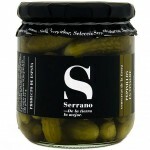 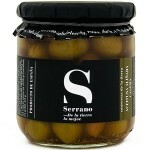 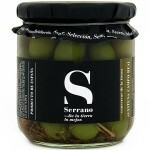 Whole Arbequina Olives by Serrano Serrano is a Spanish family business founded in La Rioja (Spain.. Whole Campo Real Olives by Serrano Serrano is a Spanish family business founded in La Rioja (Spai..
Seasoned Verdial Olives ‘Mild’ by Serrano Serrano is a Spanish family business founde..
Seasoned Verdial Olives ‘Spicy’ by Serrano Serrano is a Spanish family business found..
Pickled Gherkins by Serrano Serrano is a Spanish family business founded in La Rioja (Spain) in 1..
Gherkin-Stuffed Olives ‘Riojanitos’ by Serrano Serrano is a Spanish family business f..